Birds are chirping, leaves are turning green and our lawn already needs watering. It must be spring! Alta’s ski season wrapped up on Sunday. (See our spring wrap-up from Alta in Episode 33 when we actually brought the RV along.) It wasn’t the best winter by Utah standards, but a disappointing ski season around here still beats a great season most anywhere else, and we sure had fun! We’ll miss the Wasatch Mountains draped in their winter white, and we’ll miss the camaraderie with our Alta friends, but it’s barely over six months before we’ll be loading Alta’s Collins lift once again. Until Alta closed four days ago, we’ve been torn — do we go camping, or do we go skiing? Usually the decision was easy, as there’s a whole summer of camping ahead and there were only limited ski days left. Alta friend Bob headed out with us to Utah’s West Desert a couple of weeks ago, and we visited southern Utah for a weekend of boondocking with some other Alta friends, but other than that we were in full-on spring skiing mode until the lifts stopped spinning a few days ago. We only started this channel last fall on a whim, but once it started taking off we decided to bring you with us through the winter months via our Kitchen Table Trips series that revisited our past destinations from before we started Grand Adventure. For us, though, these episodes were no substitute for filming episodes on location. As the concept of Grand Adventure had yet to materialize last summer, we were only shooting stills on those 2017 trips, not video. 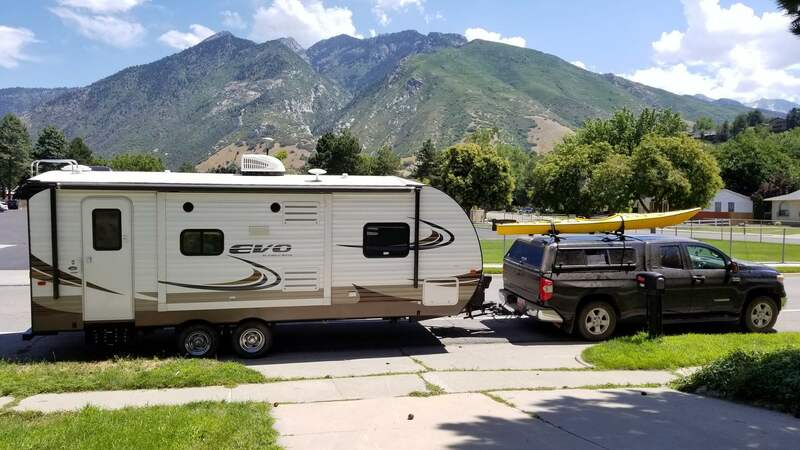 Now, however, we’re squarely back in the saddle, and we have a full six-month summer season of RV travel and filming planned to share with our Grand Adventurers. Our lonely RV is sitting in the driveway calling our names, and the pups are raring to go. We’ll be hiking, mountain biking, kayaking, sightseeing and more while out RV camping. Several 10-day trips are already in the cards, although destinations are still up in the air pending our wanderlust and weather forecasts. At the end of this month we may strike out westward across northern Nevada on the Loneliest Road, or we may head north into the mountains and forests of Idaho and Montana. We’d like to get back to the beautiful Pacific Northwest, or maybe even head across the border into Canada. The spectacular California Coast is calling us, too. In between these longer explorations, we’ll be camping around our Utah back yard just about every weekend. So many choices! We hope that you’ll come along! If you’re new around here, subscribe now to RV with us all around the Intermountain West and beyond. As we promised you when we started this channel, you’ll seldom find us in a campground — we’ll nearly always be out boondocking on our wonderful public lands and we’re only too happy to share these wonderful locations with our viewers. We’ve got a whole slew of new video gear ready to go, and we’re hoping to use it to its fullest to create better and better videos with each new release, always in full 4K Ultra HD. Sprinkled in between our RV adventure travel episodes we’ll include camping how-to’s, RV product reviews, more typical vlogs and more. Watch Grand Adventure on your computer, phone, tablet or TV — it doesn’t matter, we’re committed to bringing you some of the best adventure RV content that YouTube has to offer. And as we’ve asserted many times before, we’d be nothing without all of you. We love our Grand Adventurers! You’re all giving us a tiny glimmer of hope that we may some day be able to flip the proverbial bird to our mundane corporate existence and instead pursue our true passion, although that’s admittedly more pie-in-the-sky right now than reality. We’ve been spending money like a drunken sailor on shore leave as a result of Grand Adventure, yet it still doesn’t yet earn enough each month to even buy a half tank of gas. Nevertheless, it’s a true labor of love, and we sincerely thank you for helping us grow along with each and every one of you. We’re counting on you to tell like-minded friends and family about Grand Adventure, so please spread the word on social media! Go on — share a video for us. Who knows what might come of it?